How long can gravity store memory? DNA is a lifeform in and of itself. The memory of modern human DNA is, at the very least, more than 10,000 years old. It is far older than that, if one goes all the way back to Cro-Magnon man and Neanderthal. It is a proven fact that behavior patterns, learned skills to some degree, and instincts are passed down through DNA. One has what one could call a symbiotic relationship with one's own DNA and one's own cells. Your cells reproduce and die continually. Each cell has DNA, and this DNA stores all the information needed to make a clone. The DNA itself has a limited lifespan, just as we do. It is a lifeform in and of itself. Any memory of any lifeform is likely to be stored on gravity, if it is proven that one lifeform stores memory that way. Experiments on animals would certainly demonstrate this, and the survivors of Hiroshima and Nagasaki could tell tales of pet animals. Atomic bomb and radiation researchers can tell tales of irradiated mice and chimpanzees. You will find that animals also store their memories on gravity. Expose a rat to a lethal does of radiation, and it will die 24 hours later, but 5 minutes after being exposed, it will still easily navigate any maze it had previously learned. If humans and animals store memory on gravity, the odds are that DNA memory is stored the same way. This could be demonstrated through experiment. Some of the research has already been done, in irradiating virii in attempts to produce biological weapons, but it isn't likely the results of that research will become available anytime soon. One would have to satisfied to irradiate virii and single celled animals, because DNA is a single molecule. DNA will mutate or be destroyed if exposed to radiation. A larger lifeform such as a virus has many chemical structures, and can withstand and be able to repair a certain amount of damage to these structures. DNA and RNA are the mechanism by which this repair is conducted. In other words, there is no way to do such an experiment on DNA without destroying or mutating it. DNA can be mutated by radiation. A stroke victim suffers irreparable damage to nerve pathways. In either case, too much physical damage has been done to be repaired. In the case of a mutation, under the basic theories of evolution, the lifeforce behind the actual DNA may well have no way of knowing whether the mutation is for better or for worse, and acts purely on the instincts that allow evolution to occur. In such cases the DNA line no longer exists. But had conditions remained the same for that lifeform, it would still be alive today. The fact is that there are many hundreds or thousands of lifeforms here that have been in existence for thousands of years. Aside from evolutionary changes, the basic patterns haven't changed. There are some exceptions where the lifeform existing today doesn't begin to resemble it's predecessor that existed 10,000 years ago. There are also examples of lifeforms that have existed virtually unchanged for millions of years. These include sharks, crocodiles, and many plants and other animals. DNA from 20 million year old (and older) fossils has shown this to be true. The integrity and accuracy of the radiocarbon-14 isotope dating processes used in determining the age of these fossils has been proven beyond any doubt. 20 foot long crocodiles used to inhabit the sea that covered what is now Colorado 20 million years ago. There are vast numbers of these crocodile fossils in Colorado. Except for their smaller size, the crocodiles that exist today are virtually unchanged. This DNA has retained its memory for 20 million years or more. The facts are, DNA has memory, and this memory has been shown to be preserved for periods of more than 20 million years. Unfortunately, there is no way to test DNA as one could test a human or single celled animal to prove beyond any doubt that this memory is stored on gravity. But considering that it can be proven that the memory of every other type of lifeform known to exist is stored on gravity, it is highly unlikely that the memory of DNA would be stored any other way. On the other hand, there are many plankton and single celled life forms that exist today that have plentiful numbers of 20, 50, 100 million year old identical ancestor fossils. An experiment that created a clone from one of these existing lifeforms and the DNA of one of its 100 million year old ancestors would be worthwhile, but the results would likely be unsensational, as the resultant lifeform would not differ in the slightest from its two 'parents'. Given these lifeforms, it is obvious beyond doubt that here we have a case of memory surviving on gravity for more than 100 million years. Every time a new lifeform is conceived, the entire memory store of instinct and behavior is passed on. Giant sea turtles have existed for many millions of years. The Sea Turtles were common in the Cretaceous period of 130 million years ago. Their fossil record may well extend back at least 200 million years. Early Sea Turtles were alive with the dinosaurs although the present day genera and eight species originated within the last 60 to 10 million years. Triassochelys - Skull of an early turtle ( 160 million years ago? ), with a shell like that of modern forms, but still possessing teeth on the palate. When a newborn giant sea turtle crawls out of its shell, it does not flap its flippers in an attempt to fly. It does not use its rear flippers to try to jump. Unlike a newborn human though, it already knows how to use its flippers to move itself forward, and the first thing it does is head directly for the sea. It doesn't move away form the sea, or up the coast. How is this innate knowledge passed down from sea turtle to sea turtle? This isn't a small amount of knowledge. Assuming that memory of this type could be stored on chemicals (and we have seen that it cannot be), a single strand of DNA cannot possibly store the vast amount of information in a chemical form. There is simply far too much information to store on a single DNA molecule. 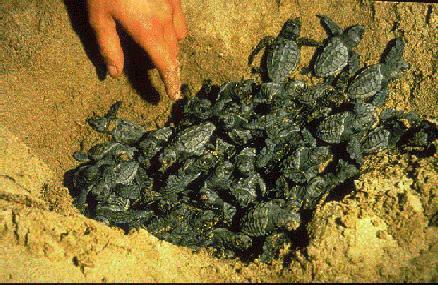 The facts show that the newborn turtles can be disoriented by artificial light. So, heading to the sea after they are born is an instinct, not a behavior. Even so, just the information necessary to triangulate on the light source, and especially, just to store the incredibly massive and complex amount of information that allows the moving and coordination of the flippers would be near the upper limits of a DNA molecule. A sea turtle DNA molecule could store all of the genetic information required to construct a new giant sea turtle, or it could store the patterns required for the chemically complex mechanisms and the associated synchronization patterns, but it could not possibly store both. The newborn sea turtle also knows how to swim, and how to navigate in three dimensions. It knows where to go to look for food. It knows how to look for a mate. It knows that the proper thing to do after mating is to find a proper type of beach somewhere, crawl up on it, and lay its eggs. These are all types of intelligence of the same general order as human knowledge. These are not chemical patterns encoded into DNA molecules. Any one of these behavior patterns would come near or exceed the storage capacity of a DNA molecule, in and of themselves. The newborn sea turtle already knows who its enemies are. Consider that the optical or even olfactory recognition patterns in and of themselves would have to contain far more individual pieces of information than there are atoms in a DNA molecule. The resolution of whichever sense is involved has to be this high, or it would be useless information to the turtle. Any of the above would involve a large amount of individual pieces of information, and a DNA molecule could realistically have enough chemical bonds to store this information. But a DNA molecule does not have enough of these storage locations to store both these and the pattern for creating a new turtle. Turtles have balance immediately after emerging from their shells. Robotics researchers have attempted to create robots that have balance capabilities. They have had some successes. The control program is always huge, and consists of millions of individual bits of information. The most complex of these robots had no more than 200 or 300 sensors and control servos. 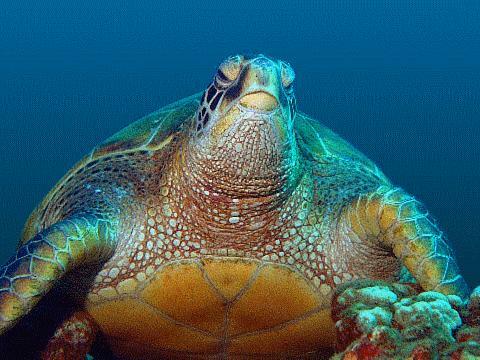 The sea turtle, and most other animals the size of a newborn sea turtle or larger, have millions of sensor equivalents, and millions of control servo equivalents. Even if one to assume that there was some equivalent to parallel processing, the 'control program' has to be truly immense as compared to the robot's program. This immense amount of information is only for the turtle's balance. When one adds up all of the newborn turtle's capabilities and knowledge, it starts becoming absurd to even consider that a single DNA molecule could store even a fraction of this amount of information. There are many big cats in Zoos, raised from cubs, whose only contact with other big cats or other members of their own species is the Zoo breeding program. But when one of these males gets put in a cage with a female, they both know what to do, including the male cat biting the female on the neck. This neck biting is learned behavior, but in this case the only place the knowledge could have come from was DNA. Female cats have been known to turn and attack the male, and the neck bite prevents that from happening. Having no one to teach it, the male still knows somehow that the female can be dangerous, and he takes the correct action to protect himself. Big cats will clean themselves with their tongues, and sharpen their claws, without ever having been in the presence of another cat. But the sea turtles are the far better example. It is a physical impossibility for a DNA molecule to store that much knowledge and behavior information chemically. Gravity stores human memory. So, it is a virtual certainty that since memory can be stored on gravity, the sea turtle's memory must be stored the same way, since it cannot be stored chemically. And some of that memory has survived for hundreds of millions of years. It isn't being passed from chemical to chemical as the DNA replicates itself, because it is not stored chemically. Copies of the memories get made, and become associated with the gravity associated with the new DNA. When a DNA molecule replicates, it transfers knowledge, stored on the gravitational fields of its atoms, to the gravitational fields of other atoms. In the example above, the inherent basic knowledge of sea turtles has been demonstrated to have survived in this way for at least 10 million years, and perhaps for as long as 200 million years. It is demonstrated fact, although you do have to exercise some degree of mental competence and some facility of logic to follow the chain of facts and the logical application of those facts. Memory can make a copy of itself, and this identical copy can be transferred from gravitational field to gravitational field. The original memory must also itself be able to move from field to field, or it could not have the capability to make a transfer among fields. A transfer is, in and of itself, a movement. To demonstrate this, a copy could be made, and then the copy left on the original field, and the original transferred to the new field. In can be no other way. If the identical copy can move, then the original must also be able to move. This copying and transferring is the method by which life and knowledge are propogated through DNA. It is doubtful that memory can only be transferred to certain types of atoms and molecules, and not others. However, life (as we know it in the 'real' world) can only be propogated by transferring the memories to the proper types of chemical structures, actually to the gravity associated with those structures. For memory to be transferred to helium, neon, argon, krypton, or xenon atoms (or factually and technically, to the gravitational fields associated with those atoms) would not serve the purpose of propogating life, since these five elements are inert and do not enter into chemical bonds. However, since this mechanism can be proven to exist to maintain and propogate memory, it is pretty safe to say that one's spirit and memories would likely be propogated by the same mechanism, moving from gravitational field to gravitational field at will. This would be the continuation of the spirit in the spiritual world. Remember, the mechanism that can allow this can be proven to exist. Go over it again if you failed to pay enough attention the first time. After that, consider that if it is proven that your memories and your spirit are stored on gravity, it is a virtual certainty that the stage which your dreams get played out on is also gravity. Any astronomer will tell you that it is a proven fact that the range of gravity of a single proton, neutron, or electron has been proven to be at least the distance between this planet and the center of the galaxy. It takes light, traveling at 186,000 miles per second, about 1/10 second to cross the diameter of the Earth, about 1/2 second to go from the Moon to the Earth, 8 minutes and 1 second to get here from the Sun, and 25,000 years to get here from the center of the galaxy. If one adds a single atom to the Earth, it is a proven fact that it will decrease the size of the diameter of the orbit of the Moon, ever so slightly. If one adds a single atom to the center of the galaxy, it is a proven fact that it will decrease the size of the diameter of the orbit of every solar system in this galaxy, ever so slightly. These immense distances are facts. The methods used in proving these facts are unquestionable. Ask an astronomer, and have it explained to you, or visit the library. Considering the truly immense range of the gravitational force of a single proton, neutron or electron, I personally have some serious doubts as to the upper limits of the memory storage capabilities of any of these. Copyright 1998, Robert J. Nelson. See also COPYRGHT.GIF, an integral component of this work, for a full legal copyright notice. This work is composed of the following copyrighted files: COPYRGHT.GIF, NUKE.HTM, DNA.HTM, and BASICS.HTM. No other files are covered under this copyright. 1) It is part of any package sold for profit, or if you gain monetary profit from the use or publication of any part of this work. 2) It is your intention to republish this work, or if you publish this work, in any medium which contains advertising of any kind.